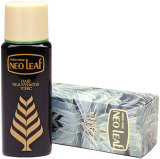 Neo Leaf - Constant hair care with Neo Leaf will enhance your hair and keep your hair and scalp in good order. Elimination of itching and dandruff. Prevention of depilation after sickness. Use once or twice daily. Splash a few drops of tonic directly onto the scalp. Press and pat lightly with the tips of your fingers thus massaging the scalp for about three minutes. Preferably after shampooing.